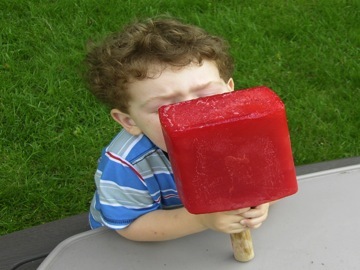 Here is a giant popsicle. I made it with a rubbermaid pitcher and a big dowel. My son and I froze it in the freezer and then shared it on a hot summer day. Yum. A one foot section of dowel (I used a 3/4” diameter dowel that was made from oak). Available at home centers for about four bucks for a three-foot section. 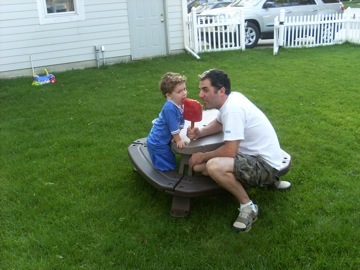 A rubbermade style pitcher. Choose one with angled sides. A freezer with some room in it. 2. You want to mix the Koolaid extra strong, so put the Koolaid and all of the sugar into the pitcher, but don’t put the proper amount of water, use much less. 3. The piece of cardboard is what will hold the dowel upright. I put a whole in the cardboard and then placed it on top of the full pitcher. 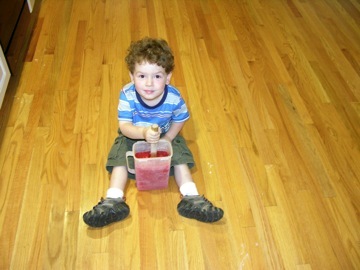 I poked the dowel through the cardboard and into the Koolaid. Note: Don’t let the dowel rest on the bottom of the pitcher. You’ve eaten a popsicle before and the stick doesn’t poke out the top, if it did, the whole popsicle would slide down onto your hand. 4. Freeze the popsicle overnight. 5. 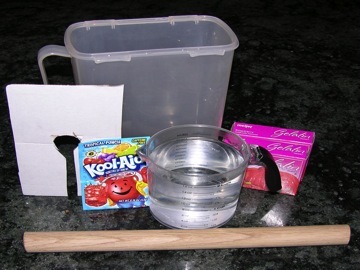 To release the popsicle, run the outside of the pitcher under hot water and it should pop out quickly. 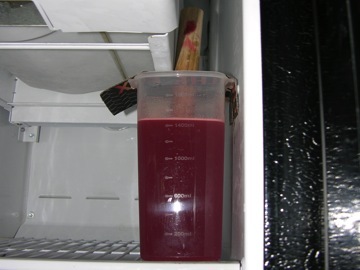 Keep the pitcher handy, after you have eaten some of the popsicle, you can put it back into the pitcher and then back into the freezer. It took us three or four days to eat our popsicles.